The CCAD module Bill of Material is the ideal tool for creating bills of materials for production and planning for a variety of industries. For many years the BOM-Module has been successfully used every day in the footwear, leather goods, furniture and automotive industries. With the CCAD Bill of Material RG Technologies offers a software that adapts itself to the material structure of each company and supports the user quickly and purposeful when creating bills of materials for the production. The CCAD Bill of Material is used for easy and fast creation of bills of materials, which serve both as a basis for collection development, as well as a prerequisite for material costing and cutting. Creating bills of materials is possible at a very early stage of the collection development, even before the technical design of a model exists. The product management can plan the materials well in advance of a new collection when developing the model framework plan. This is of advantage for industries with rapidly changing season and offers a large lead in development in the design of a new collection. In the Bill of Material, the patterns of the existing models are connected to materials. This is possible for models that have been created in the CCAD Design, or models that have been imported from other CAD systems. The technical designs are prepared with the Bill of Material on the further work process. Much of the work that would be incurred when doing the calculations and the preparation of production orders is already being done here. This is made possible by the modular structure of CCAD. The modules mesh with complete consistency. With the Bill of Material by RG Technologies it is guaranteed, that the material allocation happens at the best point of the production process and is executed by the right department. Sources of error are decimated by the centralization. A pre-disposition of the materials is possible at an early stage. The use of the CCAD Bill of Material can help a company to save time and costs within the production process, starting at the product development. RG Technologies offers different possibilities for the administration of the used materials. Administration of the materials in CCAD. There are self-explanatory functions to create, edit and delete materials, material groups and colours. RG Technologies recommends users with an extensive material database that is already on another system and is maintained there, the automated transfer of materials by an interface. Our project management is pleased to give you more information on the important issue of materials at any time. Please contact us. The material allocation can be done comprehensive for several files. The allocations are made partly to competely based on variants. The variants can be broken down to the colour, if necessary. The CCAD Bill of Material enables the user to assign every material which is needed for the production of a model. Pattern groups support in assigning pattern materials even before the construction in CCAD Design is ready. The material definition may be supplemented by terms of numbers and quantities. Assigning a department within the meaning of the production site to the material items is also possible. The CCAD Bill of Material module contains a large number of functions that simplify the creation of parts lists and increase efficiency. Thus, new variants may be already created by copying existing. Complete bills of materials can be transferred to new seasons or to different models. Missing or different material entries are easily and quickly updated or changed afterwards. The change of materials within multiple bills of materials in one step is also possible. Changes in a bill of material are documented on request. So it is always visible when a change was performed. Changes are documented with user, reason and time. Due to the variety of operating support functions a comprehensive and for the further production process extremely reliable Bill of Material can be easily created. The Bills of Materials are an important basis for the further production process of the model calculation and cutting. 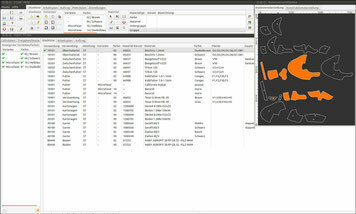 In the determination of the material requirements the CCAD material calculation goes back to the bill of material data. The results of the calculation depend not only on the geometry of each pattern, but also from several material parameters. These are especially the material size, exploitability and the expected material quality. Material changes in the bill of material can be directly considered in the calculation. The consumption values are recalculated taking into account the new material parameters. This happens automatically, based on existing calculation. The calculation results are always up to date. Production orders for cutting are being created based on the variants of the Bill of Material. It has already been defined which patterns have to be cut from which material. Sources of error in nesting are decimated. The efficiency of the cutting systems can be increased significantly. Bills of Materials can be supplied interactively in several languages and in all popular formats. The output form is designed by our project management in cooperation with the customer, according to their specifications and requirements. The form can be displayed on mobile devices such as tablets or smartphones. Production can always access the latest version of the Bill of Material. This offers especially for traveling technicians a great advantage. Working with outdated production forms is definitely a thing of the past. A production Bill of Material can be automatically linked to the results of the material costing and transferred to a connected ERP-System. The material planning can be done in a timely and secure planning.